Using the daily data collected through GeoPoll’s Media Measurement Service, GeoPoll has analyzed the top TV stations in Ghana for the first quarter of 2015, from January 1st – March 31st. GeoPoll’s data includes both ratings* and share** for all TV stations in Ghana, and this report will focus on channel share for the top stations. In March, Ghana TV stations went through a transition as JoyTV and CineAfrik were discontinued and merged into two new channels, Joy Prime and Joy News. Joy Sports was also discontinued on March 4th, and their content was incorporated into AdomTV and Joy News from March 5th onward. These changes can be seen in the tables below, which show share for January, February 1st – March 4th (before the transition), and March 5th – March 31st (after the transition). 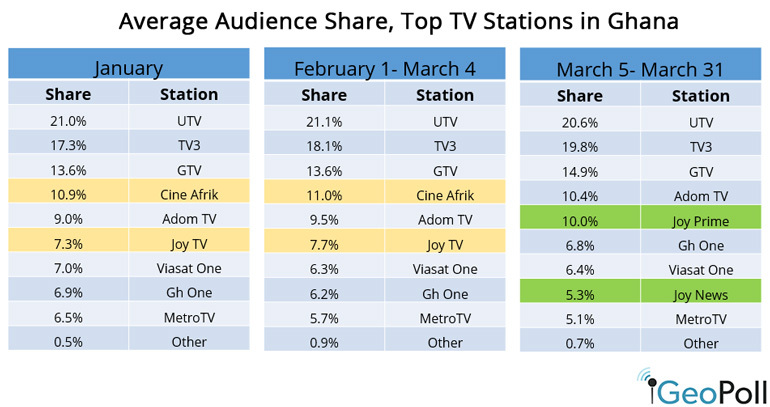 While UTV, TV3, and GTV remained the leaders in terms of share during all three months, there is some interesting movement as Joy Prime and Joy News enter the top channels from March 4th onward. From March 5th-31st, Joy Prime and Joy News had an average audience share of 10.0% and 5.3% respectively. Neither channel has yet reached the share that Cine Afrik had shown in January, 10.9%, or February, 11.0%. Over the next months as Joy Prime and Joy News become more established channels, GeoPoll will continue to report on their progress in terms of audience share.